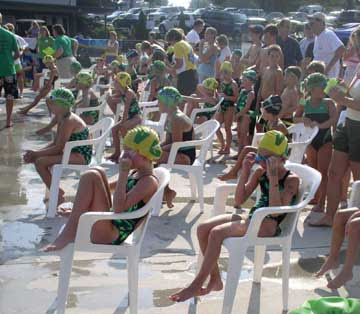 The outdoor pool at the rec center is opening Saturday morning. Wahoo! That water is going to be SOOO cold! Doesn't this picture look like all the kids have caterpillars or grubs on their heads? Maybe the style that year was named 'larvae'... Ha! I can't wait to go to 'my' other outdoor pool in Nashville which will also be opening and also be freezing cold. Hydro-thermia, here I come! Even the indoor pool felt cold to me yesterday. They had a couple of swim classes going on, THIRTEEN little ones (preschool aged) in lifejackets lined up on the edge of the pool, and half a dozen older ones taking turns jumping in at the other end. WAY cute. One of the little ones couldn't bob upright in the water with her life jacket on - she'd start kicking and splashing and end up on her back every time without being able to turn upright again. She'd float around on her back, waiting to be rescued by the teacher. She didn't seem to mind, but it was hilarious to watch. She was the ONLY one that was happening to. Hey - it's 6:16 - I'd better get a move-on. TTFN and have a nice Wednesday! Somehow the thought of teaching thirteen tots to swim is at the same time sweet and horrible. Guess someone has to do it! All my years of extreme hypervigilance with the kids near water - and they could swim, thanks to these swim instuctors who teach tots to swim. It sounds so cute to watch. I wonder if the mothers were leaning over, coaching. I remember keeping my mouth shut. Today's parents are SO INVOLVED! "C'mon, Billy, you can do it" C'mon Billy. you're great! C'mon, Billy swim harder! Swim to the right! To the left! Look out Billy! Come back Billy!" Hahaha! I love that! Froglette...perfect! I have a great swimming lessons story--one of my daughters at the age of 6 was enrolled in a summertime class to learn to swim. We put her on the bus every week day for 2 wks to go out to the nearby lake for her lessons. Every day when asked, she would say it was a lot of fun. Well later on we learned that she never went in the water the entire 2 wks! Isn't that just hilarious! Hahahaaaaaa!!!!!! WHICH daughter did THAT? ?